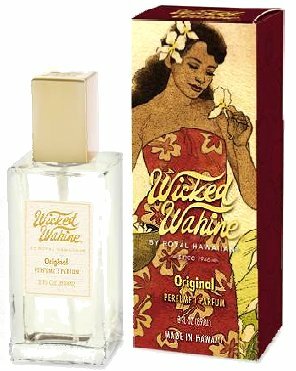 Wicked Wahine brand became famous a very long time ago when the very first Hawaiian perfume, Wicked Wahine Perfume (Original), became available for sale in Hawaii. Since those distant, nostalgic days of magnificent old Hawaii when airplanes did not come here as many still remember, Wicked Wahine captured millions of hearts all over the world becoming a legendary scent of the islands that everyone still wants to take home with them. Wicked Wahine line has expanded adding two more amazing fragrances in the recent year or two, a deliciously delightful and happy Wicked Wahine Rose Perfume and sophisticated, contemporary Wicked Wahine Hibiscus Perfume. It also brought back the much anticipated Wicked Wahine Body Lotion in a slightly different form that was known as a pearl essence previously. Be sure to check this famous line of classy island products below.